From the first moment I picked up Ms. Owens’ manuscript, The Lady of the Haven, her vivid and gripping storytelling held me captive. Not one to read fiction, this book proved to be a worthwhile and wonderful exception, because the romance, adventure, intrigues and challenges are all interwoven and influenced by Christian values. It is the compelling story of a young woman left alone who is faced with seemingly insurmountable obstacles that are so severe her life and the future of her homeland are in jeopardy. With faith and courage that can only come from God, she pursues her destiny with passion and persistence. 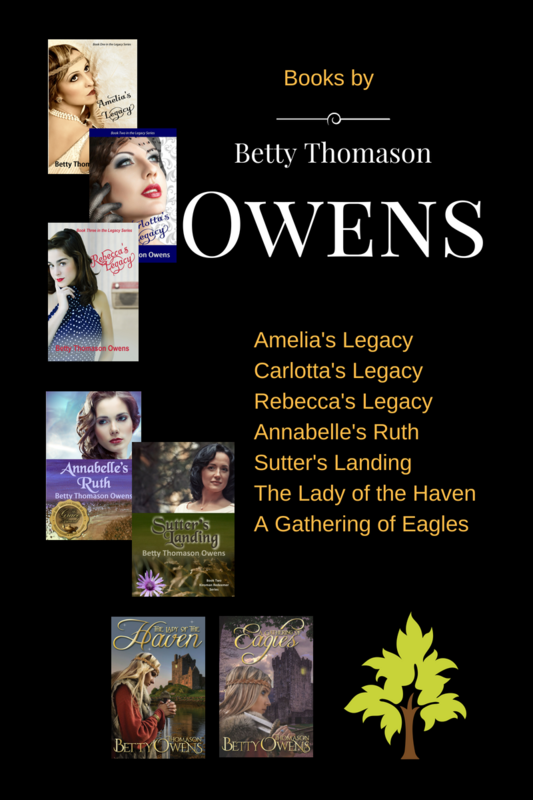 Betty Owens is a gifted author, second to none, who knows how to tell a story that entertains and inspires at the same time. Those who love to read, enjoy a well-told story and want to finish a book with satisfaction and encouragement will not be disappointed. It is with pleasure and pride that I recommend this book to you!–Diana S.